Homeless protesters who set up tents on the grounds of Honolulu Hale yesterday took shelter from the rain. Mayor Mufi Hannemann has announced that homeless people displaced from Ala Moana Beach Park will have a new place to sleep at night: the grassy area next to the Honolulu Police Department headquarters, from 9 p.m. to 5 a.m. daily, beginning tonight. "We are going to allow people to erect tent-like structures, which will need to be removed each morning," the mayor said yesterday as rain pelted an encampment on the sidewalk next to City Hall protesting the eviction from Ala Moana park. Hannemann said the homeless who stay by the police station will also need to take personal belongings with them each morning when they leave. "We shouldn't be having permanent structures there 24 hours," he said. 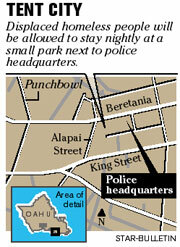 "That's just a ... place for them to go in the evening when Ala Moana park is shut down." Known as Sister Roberta Derby Park -- for the late Catholic nun, a longtime police chaplain -- the park is atop the police parking structure at South Beretania and Alapai streets. Hannemann stressed that the use of the area for the homeless is a short-term fix, until more permanent solutions are put in place through the state, social service agencies and community organizations. "At the end of the day, it's going to take many of them going back to work, rehabilitating, and we need affordable housing, big time," Hannemann said. "These are resources at the state level." Hannemann said he lauds the meeting being organized by Gov. Linda Lingle tomorrow at 10 a.m. with homeless advocates and other agencies. The mayor's plan comes a day after the city began closing Ala Moana Beach Park from 10 p.m. to 4 a.m. each day in what the city said was preparation for a major renovation April 25-27. Dozens of homeless people and their advocates marched from Ala Moana to Honolulu Hale on Monday evening, protesting the park closure and the displacement of those who sleep in the park at night. Four people were arrested for trespassing after refusing to leave City Hall premises. About a dozen or so protesters set up camp yesterday, some eating pastries set up in the mayor's parking space. Among those arrested was homeless advocate Utu Langi, whose H-5 Project feeds and provides services to the homeless in the parks. Langi said he is happy and satisfied with the mayor's plan. "Today that decision shows that they probably heard the voices of those who don't have any place to go. That, to me, is something, and I appreciate that," said Langi, standing on the sidewalk next to City Hall in a downpour. "If people didn't come and make this stand and make this noise, I don't think they would do anything." Several homeless people standing with Langi said they would probably take up residence at the grassy area next to the police station. "It sounds like it's a good idea only if there is no harassment," Steve Brooks said. "If we all comply with it ... this thing is a start." Mio Sapolu, 47, who has lived at Ala Moana park for several months, said they could probably camp out in front of city buildings for the next month. "But they don't want to do that, because they would be in the eye of the public." Hannemann met with several clergy and social service agencies before making his announcement. When he emerged from the meeting, the mayor urged faith-based and other community groups to help the homeless. He was pleased with a call from Central Union Church, which pledged to help the homeless from the park. Hannemann said he also helped two friends who were living in the park. "I was just able to find them places to go (Monday) night," Hannemann said. "They're friends of mine that stay there. ... I had been going through and I knew a couple of people that needed some help, so I directed them to go someplace."